Alimuddin Mohammed, son of Kamaluddin Mohammed, received the Order of Caricom award on behalf of his father at the CARICOM summit in ST Lucia. St. Lucia: Former Trinidad Government Minister and CARICOM Ambassador Kamaluddin Mohammed was awarded the CARICOM’s highest award, the Order of Caribbean Community (OCC), during the Opening Ceremony of CARICOM Heads of Government meeting in St Lucia on 4th of July. 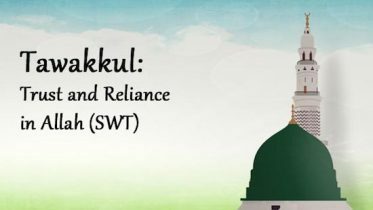 According to a CARICOM Secretariat release, the conference of Heads of Government of CARICOM , at its 33rd regular meeting in St Lucia, conferred the honour on Mohammed for the decisive role he played in what can be considered the “Replanting of the Caribbean Vineyard”. The Order of the Caribbean Community is an award given to Caribbean nationals whose legacy in the economic, political, social and cultural development of Caribbean society is phenomenal. The award was established at the Eighth Conference of CARICOM Heads of Government in 1987, but was first conferred on Trinidad and Tobago’s William Demas; Guyana’s Sir Shridath Ramphal and St Lucia’s Nobel Laureate, Derek Walcott in 1992. Mohammed has enjoyed an illustrious 30-year political career. “Chach” (abbreviated from Chacha which means uncle – father’s brother), as he is affectionately called, was an MP and Minister from 1956 to 1986. Mr Mohammed served in various cabinet positions in his native country and is a founding member of the People’s National Movement (PNM) . He acted as Prime Minister on several occasions during that period and later served as CARICOM Ambassador under the Basdeo Panday UNC Government. He is also the recipient of a Doctor of Letters honoris causa from the University of the West Indies and his country’s highest award, the Order of Trinidad and Tobago. Mohammed was also awarded a plaque from the Anjuman Sunnatul Jamaat Association of T & T (Trinidad’s representative Muslim organization) in recognition of his service to nation and community. In a citation read by Ambassador Colin Granderson, CARICOM Secretariat’s Assistant Secretary General of the Foreign and Community Relations Directorate, Mohammed was singled out for his contribution as West Indian Affairs Minister, especially in relation to his contribution to the forging of Caribbean economic cooperation. The citation stated that his role in the early integration movement earned him the moniker “Mr CARIFTA” which was no misnomer, and given the community’s trade and economic cooperation structures, including the single market, which have been built on the foundations that he played such a leading role in “planting”, makes him most deserving of the community’s highest accolade. Mohammed is now entitled to affix the letters OCC behind his name. He also received an 18-carat medallion and a miniature version of the CARICOM insignia in the form of a lapel pin. He joins the ranks of 24 other Caribbean stalwarts. In a letter to the CARICOM Secretariat dated June 27, 2012, Mohammed said he was pleased to be given the distinguished award. He said he had fond memories of former Prime Ministers Dr Eric Williams, Forbes Burnham (of Guyana), Michael Manley (Jamaica) and others. Mohammed said he also served with former Commonwealth Secretary General Sir Shridath Ramphal, while he was Foreign Minister of Guyana. He expressed his gratitude to Prime Minister Kamla Persad-Bissessar and the People’s Partnership Government for nominating him for the “prestigious honour.” Mohammed was unable to travel to St Lucia to receive the award, owing to ill health, his son Alimuddin Mohammed received the award on his behalf. 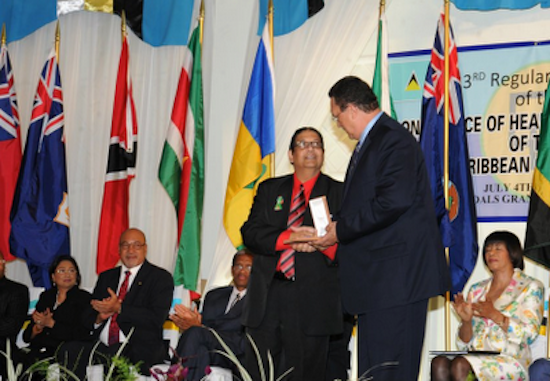 Be the first to comment on "FORMER MINISTER KAMAL GIVEN CARICOM’S HIGHEST AWARD"